"An eternal being created human society as it is to-day, and submission to 'superiors' and 'authority' is imposed on the 'lower' classes by divine will." This suggestion, coming from pulpit, platform and press, has hypnotized the minds of men and proves to be one of the strongest pillars of exploitation. Scientific investigation has revealed long ago that human society is not cast in a stereotyped mould. As organic life on earth assumes different shapes, the result of a succession of chemical changes, so the group life of human beings develops different social institutions as a result of increasing control over environment, especially of production of food, clothing and shelter. Such is the message which the works of men like Bachofen, Morgan, Marx, Darwin, and others, brought to the human race. But this message never reached the great mass of humanity. In the United States the names of these men are practically unknown. Their books are either out of print, as is the case with the fundamental works of Morgan, or they are not translated into English. Only a few of them are accessible to a few individuals on the dusty shelves of some public libraries. Their message is dangerous to the existing order, and it will not do to give it publicity at a time when further intellectual progress of large bodies of men means the doom of the ruling class. The capitalist system has progressed so far, that all farther progress must bring danger to it and to those who are supreme through it. But the forces, which have brought about the present social order, continue their work regardless of the wishes of a few exploiters. A comprehensive work summarizing our present knowledge of the development of social institutions is, therefore, a timely contribution to socialist propaganda. In order to meet the requirements of socialists, such a summary must be written by a socialist. All the scientists who devoted themselves to the study of primeval society belonged to the privileged classes, and even the most radical of them, Lewis Morgan, was prevented by his environment from pointing out the one fact, the recognition of which distinguishes the socialist position from all others—THE EXISTENCE OF A CLASS STRUGGLE. The strongest allusion to this fact is found in the following passage of "Ancient Society": "Property and office were the foundations upon which aristocracy planted itself. Whether this principle shall live or die has been one of the great problems with which modern society has been engaged.... As a question between equal rights and unequal rights, between equal laws and unequal laws, between the rights of wealth, of rank and of official position, and the power of justice and intelligence, there can be little doubt of the ultimate result" (page 551). Yet Morgan held that "several thousand years have passed away without the overthrow of the privileged classes, excepting in the United States." But in the days of the trusts, of government by injunction, of sets of 400 with all the arrogance and exclusiveness of European nobility, of aristocratic branches of the Daughters of the Revolution, and other gifts of capitalist development, the modern American workingman will hardly share Morgan's optimistic view that there are no privileged classes in the United States. It must be admitted, however, that to this day Morgan's work is the most fundamental and exhaustive of any written on the subject of ancient social development. Westermarck's "History of Human Marriage" treats the question mainly from the standpoint of Ethnology and Natural History. As a scientific treatise it is entirely inadequate, being simply a compilation of data from all parts of the world, arranged without the understanding of gentile organizations or of the materialistic conception of history, and used for wild speculations. 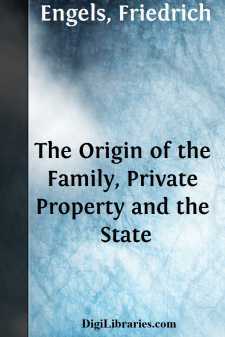 Kovalevsky's argument turns on the proposition that the patriarchal household is a typical stage of society, intermediate between the matriarchal and monogamic family.